Since his days as a fresh-faced young DJ regularly playing at the 414, Ali’s career has gone simply stratospheric! Ever since his Tekelec imprint exploded onto an unsuspecting club land, his unique techno influenced take on trance music has won him legions of fans, including some of the biggest names in dance music. Since then he’s released tracks on many of the world’s biggest labels such as Warner, Armada, High Contrast, Toolroom, Spinnin, Incharge, and Flashover. Tech trance monsters like ‘Shakedown’, ‘Pandora’ and ‘Danger’ have ended up as firm fixtures in the wallets of some of dance music’s top names such as Sander Van Doorn, Carl Cox, (who named him his producer of the year 2006), Judge Jules, Ferry Corsten, Gareth Emery and Armin Van Buuren. Ali’s showing no signs of slowing up on the production front, having recently completed remix work for Tiesto and Armin, collaborating with the mighty Marco V on their recent release ‘Kaos Theory’ and has a brand new artist album set to drop this September. 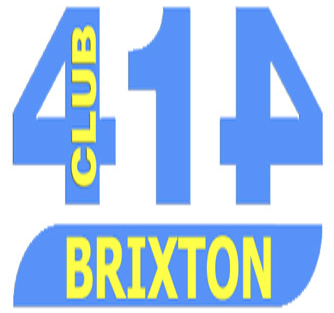 Ali’s profile is only going one way – up and fast – so we’re of course delighted we’ve managed to secure a set from him in the intimate surrounds of Club 414. This is simply not to be missed, expect stacks of unreleased and exclusive material (including perhaps a few of Ali’s trademark bootlegs), flawless mixing and all carried along by Ali’s distinctive and irresistibly funky techno rhythms! Our next guest is a firm favourite for many London clubbers, the one and only Matt Lock! He’s been missed on his travels, and we’re over the moon to welcome the prodigal son back to Puzzle! Matt will be on warm up duties for us this time, you can expect an hour and a half of the finest aural treats. You’ll certainly hear some of the quality trance Matt’s renowned for, but with Mr Lock having developed a new found taste for housier sounds you’re in store for an eclectic selection of chunk, funk and good old fashioned uplifting trance. Make sure you get down early to catch Matt in action! 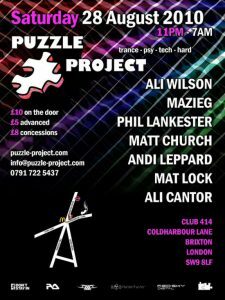 Next up is Puzzle’s very own Ali, a DJ who since securing his residency for Puzzle in January has proved himself a firm favourite with the Puzzle crowd. This man plays the very best trance out there – and this month he’ll be pulling out all the stops with a late night set featuring the very best driving tech trance, with of course a potent dose of good old hands-in-the-air euphoria. 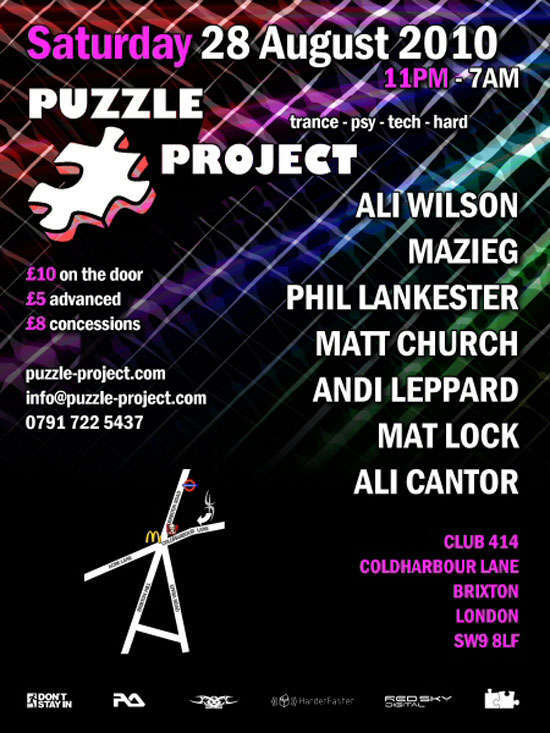 Make sure you don’t miss out – Ali’s sure to show why he’s building a reputation as one of London’s most exciting up and coming trance jocks!